It’s been a while since authorities started their surveillance actions to monitor various actions, let it be web browsing or downloads, of each internet users. To be precise, it was since internet had established itself as a powerful way for communication and expression. Yet, debunking all those so-called efforts, there was rise of various solutions to keep yourself anonymous in web too! Virtual Private Network Tunneling, or VPN Tunneling when abbreviated, is indeed a noticeable feature that lets you grab that power of anonymity. In this post, however, we are here to have a review of CactusVPN, which is one of the widely used and immensely popular Virtual Private Network Tunneling solutions that are available in market. First, we shall have an introduction to CactusVPN and then will move on to explore different aspects of CactusVPN as a competitor of many other VPN Tunneling solutions out there. CactusVPN is a wonderful service when it comes to accessing various internet-based services without revealing your actual identity to websites whereas keeping your actions encrypted from authorities, who have set up surveillance in order to track your movements. There are a number of features that make CactusVPN the best when compared with other solutions in the category. So, in order to understand the service in a better way, we shall have a look on those features. Along with anonymity while accessing web, you can use CactusVPN to secure information that you exchange as well, particularly when you are accessing internet through public Wi-Fi hotspots. Since CactusVPN creates a secure tunnel and exchanges information through the tunnel, in an encrypted way, you should never be scary about losing data. To make things even authentic, CactusVPN is using 256-bit AES encryption technology to encrypt transferred data. Despite the fact that dedicated VPN software are available for only a few platforms — Windows and Mac —, you can use CactusVPN in a huge variety of platforms and the list includes iOS, Android, Ubuntu etc. And the best part of the solution is that you can have step-by-step tutorials to implement CactusVPN in all these platforms, with screenshots! 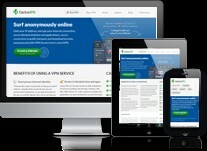 As we said, dedicated VPN software of CactusVPN is available for both Windows and Mac devices. Using this tool, it’ll be possible for you to connect to the desired VPN server in single click. Apart from the easy-to-understand UI, it has to be noted that CactusVPN software has a number of productive features. One of such is Application Killer, which is helpful in instantly closing certain applications when VPN connection is stopped as though to get rid of legalities! 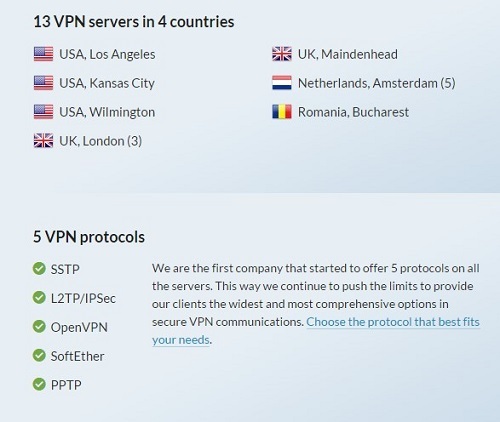 When compared to other VPN solutions out there, CactusVPN has a huge number of VPN servers — 14 VPN servers, spread in five countries such as UK, USA, Netherlands, Romania. While you can use other servers to browse web in an anonymous way, Netherlands and Romania servers of CactusVPN offers torrent downloads as well. 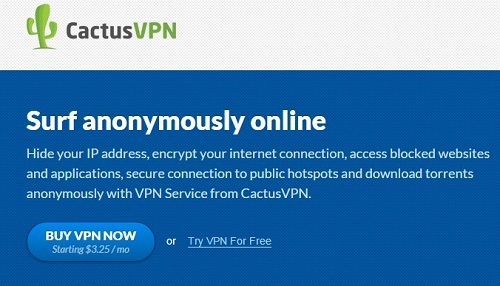 Also, various VPN protocols are available from CactusVPN as though to meet different requirements of yours. While considering all these sections, CactusVPN is undoubtedly the best when it comes to an effective, secure & an easy-to-use VPN. Particularly, we loved its intuitive UI-based tools and huge number of servers.